To change the ip-address along with the hostname, follow the steps shown below. In this example, we’ll change the hostname from dev-server to prod-server. The following will change the hostname to prod-server. If you have entries in the /etc/hosts file with the old hostname, you should modify it. For example, the entry for 127.0.0.1 line in the /etc/hosts file will still show the old hostname. In this example, it shows as dev-server. Modify this file, and set the new hostname here. For example, change dev-server to prod-server as shown below. The /etc/sysconfig/network file also has an entry for HOSTNAME. Change the value here as shown below. Restart the network service, if you want any other services that are using the hostname to pickup the changes. If this is not a production system, you can also reboot the system to make sure the hostname is changed properly, and the system is picking it up properly during startup. If you have desktop related utilities installed on your system, you can change the hostname from the GUI. Execute system-config-network from the command line. 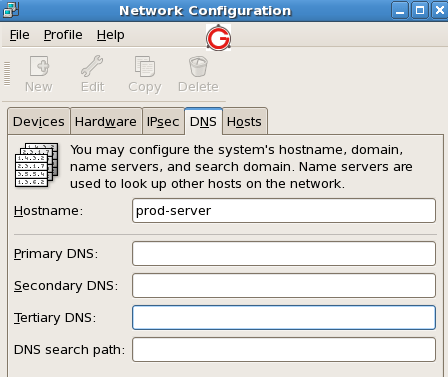 This will display the “Network Configuration” GUI. Go to the “DNS” tab and change the hostname from here as shown below. Under the /etc/sysconfig/network-scripts directory, you’ll see file for every network interface on your system. For example, if your interface is “eth0″, you’ll see ifcfg-eth0 file under this directory. Modify the ifcfg-eth0 file and change the IPADDR field accordingly as shown below to change the ip-address. If you’ve defined the ip-address in the /etc/hosts file, make sure to change those also. For example, if you have a FQDN that was pointing to the old ip-address in the /etc/hosts file, change it to the new ip-address. Depending on how you’ve configured your system, you might not have to do this step. Finally, restart the network service, for the system to pick-up the changes. If this is not a production system, you can also reboot the system to make sure the hostname and ip-address is changed properly, and the system is picking it up properly during startup.